This is Tim Ellis' acclaimed version of the classic 'Razor Blade Swallowing' effect. You take five razorblades, each blade slices through a card or piece of paper and is immediately placed into the mouth and swallowed. Once all five blades are swallowed, a length of thread is also swallowed and when it is pulled back out of the mouth all five blades are threaded onto it. Your mouth is empty and can be examined. "Great stuff and by far the best routine I've seen." "Ellis offers a first rate version of the classic razor blade routine where he swallows a series of blades, which ultimately reappear out of his mouth, threaded on a string. Ellis' brilliant approach maximizes safety but still allows him to use the blades to visually slash jumbo playing cards. And the clean-up is logical, humorous and pure genius." 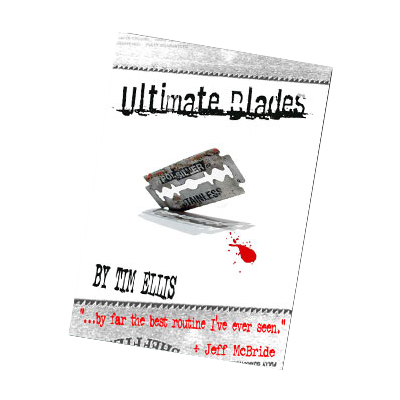 "He opened with Ultimate Blades, his version of razor blade eating, and fooled everyone with it. One at a time, each razor blade is used to cut a piece of paper (really) and then put directly into his mouth. After eating 5 blades he swallows a couple feet of dental floss and brings the blades out threaded. Not only is this method a fooler, Tim provides the presentation to make it entertaining magic (as he does with every effect in the lecture)." "The effect that Tim presents is every bit as nerve racking and scary as any razor blade trick that I have seen to date - and I have seen a slew of them. Placing sharp pieces of metal in the mouth has always bothered me...probably one of the reasons why I have never done it. That said, Tim uses the blades to cut paper, swallows the whole lot and then produces all the blades dangling on a piece of dental floss. The best part of the whole affair is the method, which is so darn easy and clever that even I'm tempted to give this a whirl." "A clever, safe method for the razor-blades-from-mouth with a funny gag at the end that could be incorporated into any version of the effect"
"The Razor Blades have answered all my questions to you previously -I look forward to rehearsing this in the coming months incorporating some moves into my own routine as well." ""We know the Razor Blade trick; We've performed the Razor Blade trick in front of real audiences; The Razor Blade trick was a closer of ours; And Mr. Ellis, that's no Razor Blade trick." What Mr. Ellis demonstrates seems to be more of a circus freak-show stunt. It appears there is no trick to the trick. It looks like he is actually swallowing sharp razor blades. That's not how we do it. He demonstrates the sharpness of each blade before placing it on his tongue and swallowing. Watch the video carefully, very carefully. Each razor blade Mr. Ellis places on his tongue actually slices a jumbo playing card. No switches! We backed-up the video, zoomed in, and even ran it through a sophisticated video analysis tool on loan (sort of) from the Bahamian equivalent of our CIA. No switches. As Tarzan might say, "blade sharp, cut card in half, get eaten but man with funny accent no bleed. Man scare Tarzan." How does he do it? Because we know everything there is to know about anything, we were pretty sure we had it figured out. The secret is different than anything we expected and suddenly makes what could be a very dangerous trick very safe. If you have performed the Needles or Razor Blade trick, you know one of the crucial moments comes when you need to go south with the goods. (This is magician slang so only magicians know what we're saying - clever, no?) Like the first time we used a straw to eat chicken noodle soup, this can be a messy and awkward moment. Mr. Ellis had designed a routine that not only allows you to perform the trick safely but leaves you totally clean at the end."